The Friedman Memorial Airport air traffic control tower will remain open through September, airport officials decided on Tuesday. 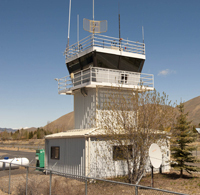 The Friedman Memorial Airport Authority on Tuesday voted unanimously to pay about $170,000 to fund the air traffic control tower through Sept. 30, the end of the fiscal year. The money will come from operational reserves and will not require a budget amendment. Airport Manager Rick Baird said during the meeting Tuesday that the action was necessary, despite action from Congress late last month that provided the Federal Aviation Administration with $253 million that would enable them to cut air traffic controller furloughs short and fund air traffic control towers through the end of fiscal year 2013. The reason is that the legislation lacks specific language directing the FAA to use that money to fund 149 towers that are operated under contract and were slated for closure in June. Baird said the FAA has not stated whether or not it will keep the federal contract towers—one of which is Friedman—open. Since then, 112 members of Congress and a coalition of 70 city mayors—including Hailey Mayor Fritz Haemmerle—have sent letters to the FAA directing them to use that money as was intended by Congress. Baird said that in the meantime, the FAA has directed Friedman staff to address how they would operate to keep taxiways safe when commercial aircraft such as the Bombardier Q-400 and Embraer 120 are landing and taking off. The Q-400, used by Horizon Air, currently operates under a letter of agreement between the air traffic control tower and the airport, which states that the tower will “sterilize”—or completely clear—the taxiways when the Q-400 is operating on the runway. Because the Q-400 exceeds the airport’s design standards, such a letter is required for the craft to operate at Friedman. No such letter has been required for the Embraer 120, operated by SkyWest Airlines. But Baird said that the FAA is now requiring him to explain how he would clear the taxiway for operations for both aircraft, and have those procedures approved by the FAA. Baird said he believes a study of alternatives, set to be conducted by Boise firm T-O Engineers, will show that the airport needs a tower to keep the taxiway clear. The board agreed to fund the tower from June 16, the day it was first set to close, through Sept. 30. Originally, the FAA had offered to allow the tower to remain in the federal air traffic control system through July 15. However, Baird said the agreement required to do so will likely not be signed by Serco, the company that operates the air traffic control tower, because of various restrictive conditions. Baird said airport staff are still working with the FAA and Serco to resolve the issues.